*I was contacted by notonthehighstreet.co.uk to choose some items that I would like to receive and review. I was so grateful and excited as I am getting married next year in Italy so need to start collecting items to send over, so as soon as I could I hopped over the site and struggled to narrow down my favourites! The site offers so much, from gifts to homeware and even a wedding section! I clicked on the wedding section to find a huge selection of items, everything from tableware to guest books. My Italian wedding will be quite particular which I wont go into detail just yet. A part of the wedding is outside on a mountain, amongst lemon trees. I really want to have candle light and fairy lights on the trees for the evening so was keen to find something unusual to hang outside. I chose a Crystal Chandelier Tea Light Holder. A gorgeous sparkly tea light holder to hang outside! I would have photographed these items myself but unfortunately they were put away in my wedding box in the attic and cant get up to get them! 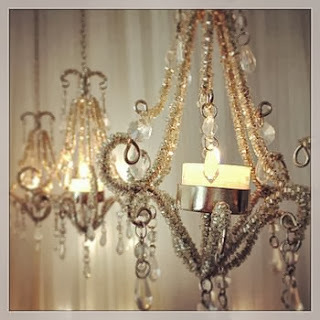 This chandelier was £24.95, the link is below. Though this was smaller then what I thought it really is stunning and am excited to use this! For my next item I decided to chose something that is "sensible" as in an item which is required not desired, so I decided to look at the guest books. They have a huge selection but I decided to go for something simple and leather. 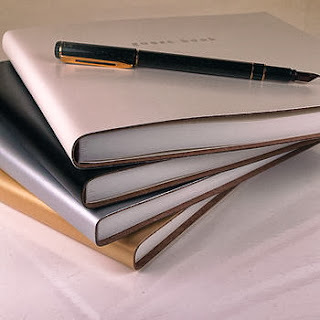 I chose a Classic Leather Guest Book in the shade Ivory, as seen as the top book in the picture below. As I said above I would have taken a personal photo but had to take this one from the website due to it being packed away at my parents house already. This guest book is beautiful, it is 22.5x18.5cm so is a good size, it is leather, it looks and feels like good quality. The pages are off white and unlined so perfect for fitting all your guests messages. This item is £32. See link below for more details. Let me know whether you have purchased off this site! Congratulations! The chandellier is gorgeous.